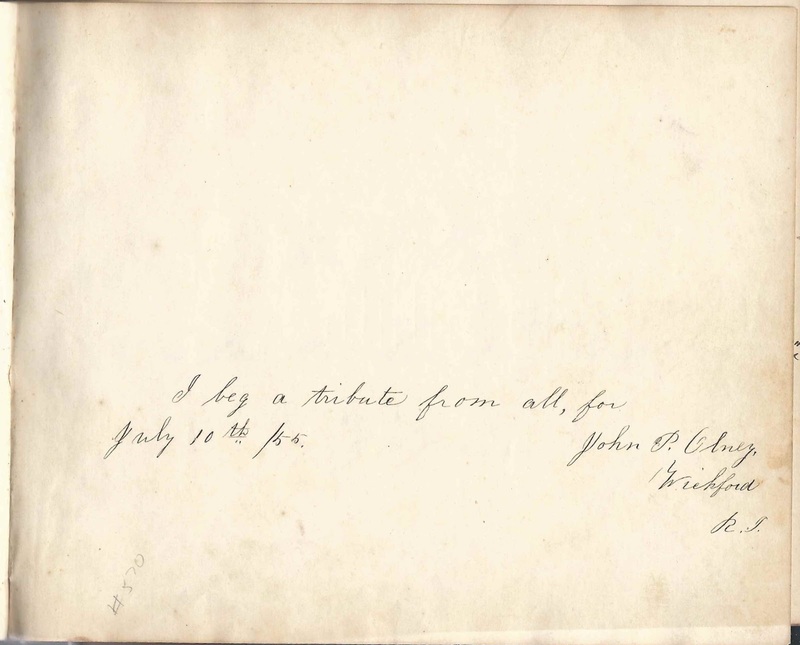 1850s autograph album of John Palmer Olney of Wickford, Rhode Island, kept while he was a student at Kingston Classical Seminary and, the following year, at Berwick Academy at South Berwick, Maine. From a label he pasted on the inside front cover, it appears that this was the 28th book in his library and that he had purchased it for the price of $.75. 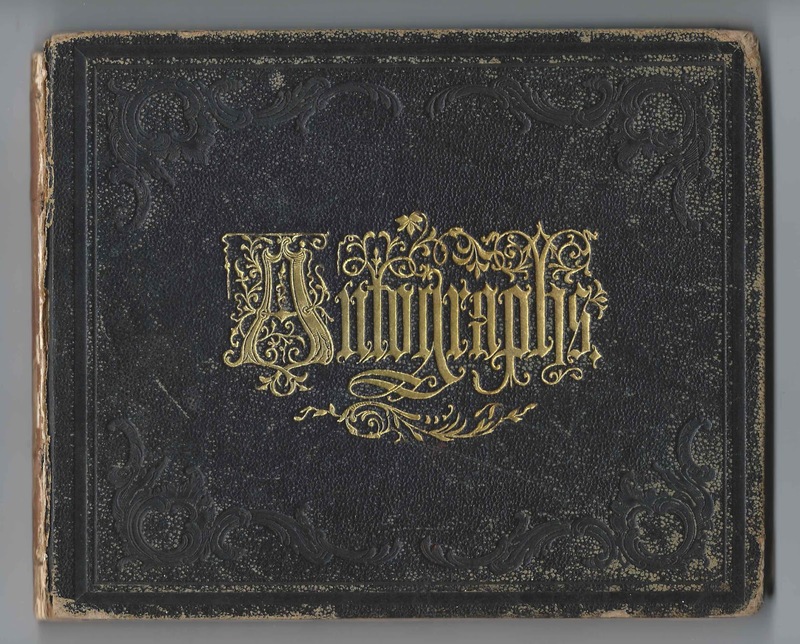 On July 10, 1855, John inscribed a page to the people who would be signing pages in his album. 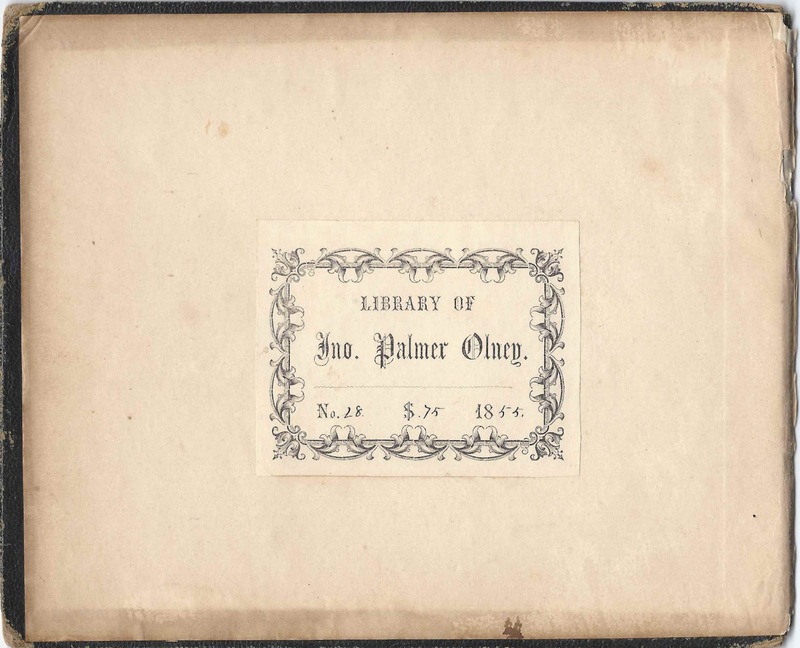 The album is approximately 8" x 6-1/2" and contains the sentiments of 67 of John Palmer Olney's relatives, schoolmates, teachers and friends. An alphabetical list of the signers, with their dates of signing, residences and any school affiliation mentioned, appears at the end of this post. John Palmer Olney was born in Rhode Island, possibly at Providence, on 6 April 1837, the son of John and Abigail Remington (Northup) Olney, who died in 1847 and 1839, respectively. The 1850 Census lists their son John as living in the household of his mother's brother, Abial Palmer Northup, and his wife Thirza Slocum (Hall) Northup and family. 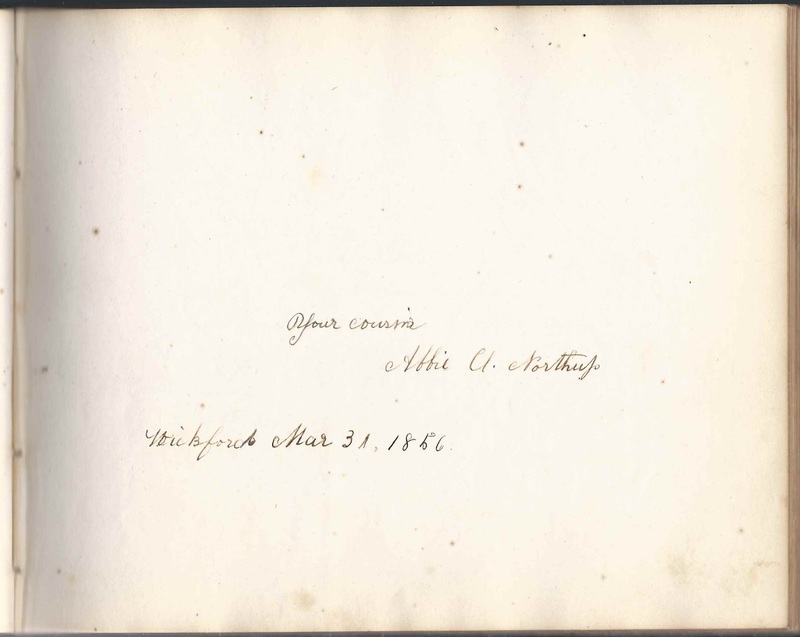 The one person in the album to mention a family relationship was "cousin" Abbie O. Northup, who inscribed a page at Wickford, Rhode Island, on March 31, 1856. Her middle initial looks more like a U, but I believe she was Abbie Olney Northup, daughter of Abial and Thirza. 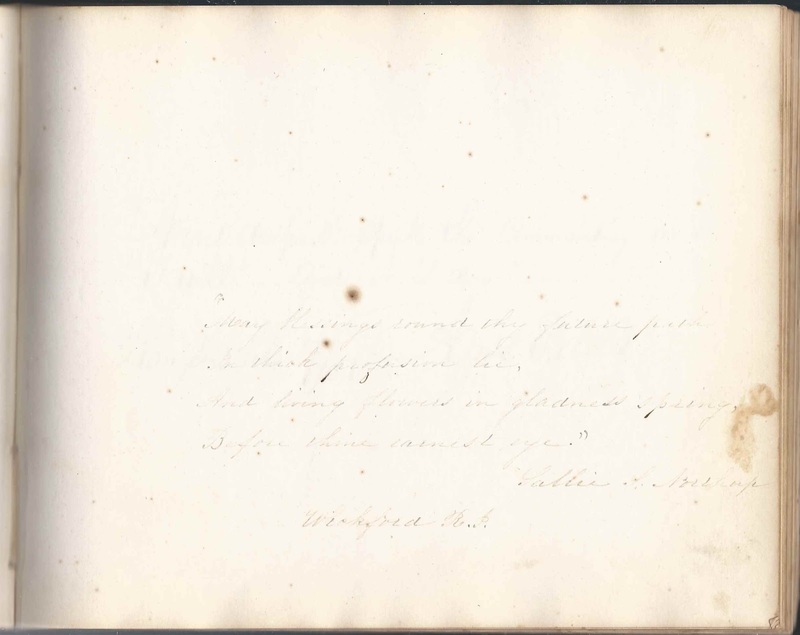 Abbie's sister Sallie S. Northup also signed a page, at Wickford, Rhode Island. One of John's teachers at Berwick Academy was Dr. Joseph B. Montagu Gray, who was born in England, educated at Oriel College at Oxford University, Harvard College, and Dartmouth College, and was a recognized classical scholar. He died in 1856 while teaching at Berwick Academy. On 2 February 1864 at Rollinsford, New Hampshire, John Palmer Olney married Harriet Amanda Watson, daughter of Humphrey Sargent Watson and Harriet Amanda (Shedd) Watson. Harriet Amanda Watson was born 15 July 1839 at Chelmsford, Massachusetts. It's likely that John and Harriet met at Berwick Academy, as both are listed as students in A Memorial of the 100th Anniversary of the Founding of Berwick Academy, South Berwick, Maine, published in 1891. In fact, there's a page with very faint handwriting that appears to have been signed by Hattie A. Watson. I've tweaked it a bit to make the handwriting stand out more. See an image of the gravesite of John Palmer Olney and Harriet Amanda (Watson) Olney here. Kate ?, signed at Kingston, Rhode Island, on July 23, 1855. Surname possibly Dwyer or Dupree or ? Mary L. Aldrich, signed at Kingston Seminary on July 16, 1855. Sister of signer Annie M. Aldrich. They were the daughters of Luke and Ann Aldrich of South Kingston, Rhode Island. Annie M. Aldrich, signed at Kingston Classical Seminary on July 16, 1855; sister of signer Mary L. Aldrich. They were the daughters of Luke and Ann Aldrich of South Kingston, Rhode Island. Lina R. Barron or Lina R. Barrow or ? Rufus C. Beal, Postmaster, Orfordville, New Hampshire. Rufus C. Bean (1816-1862) was the brother of signer Fannie K. Beal. Fannie K. Beal, signed at Orfordville, New Hampshire, on July 28, 1856. Fannie (1820-1907) was the sister of signer Rufus C. Bean; soon after inscribing this page, she would marry Sylvester Blood, on 18 September 1856. Elvira S. Bond of Cochituate, Massachusetts, signed at Kingston Classical Seminary on July 10, 1855. Elvira Susan Bond (1835-1877) would marry Benjamin F. Cutter at Wayland, Massachusetts, on March 5, 1859. O. S. Brown of Whitinsville, Massachusetts, signed at Kingston, Rhode Island, on July 14, 1855. Possibly Orange Scott Brown, son of Rowland and Nancy Brown. O. F. Browning of Gales Ferry, Connecticut, signed at Kingston Classical Seminary on July 13, 1855. Presumably Oren Fogle Browning (1838-1899), who married Mary Gertrude Clarkson on October 17, 1859 at Manhattan, New York. George Lincoln Came of Alfred, Maine, signed at Berwick Academy on February 1, 1856, Friday. Born in 1836; died 1900. Sara de Godefroi, signed at Warwick, Rhode Island, on March 26, 1856. Presumably Sara Godfrey, using the original spelling of her surname. Augusta E. Goodwin, signed at South Berwick, Maine, on January 27, 1856. Presumably the Augusta E. Goodwin who was the daughter of Charles Goodwin and wife of James M. Harvey. J. B. Montagu Gray, signed at Academy House, South Berwick, Maine, on January 27, 1856. Dr. Joseph B. Montagu Gray, M.D. (1818-1856)was a graduate of Oriel College, Oxford University; attended or taught at Harvard University and received an honorary degree from Dartmouth College in 1856 . He was a classical scholar who died of a fever while teaching at Berwick Academy. John W. Hayes, signed at Berwick, Maine, on February 8, 1856. Possibly John William Hayes (1838-1902), son of Elijah and Jane Hayes and future husband of Frances Harriet (Cole) Hayes. Lizzie B. Hazard, signed at Kingston, Rhode Island, on July 14, 1855. She was Elizabeth B. Hazard, whose sister Harriet Maria Hazard also inscribed a page. They were the daughters of William and Harriet (Brenton) Hazard. Hattie M. Hazard, signed at Kingston Classical Seminary, on July 14, 1855. She was Harriet Maria Hazard, whose sister Elizabeth B. Hazard, "Lizzie", also inscribed a page. They were the daughters of William and Harriet (Brenton) Hazard. M. Luella Hollis, signed at South Berwick, Maine, on February 5, 1856. Presumably Mary Luella Hollis (1838-1870) of Brighton, Massachusetts; she would marry Gideon Perry Brown. Sue J. Jordan, or Sere J. Jordan, signed at South Berwick, Maine, on February 6, 1855. There was a Susan J. Jordan and a Sarah Jordan listed in a Berwick Academy publication of that era. J. Mann, signed at Kingston, Rhode Island, on July 13, 1855. He was Rev. 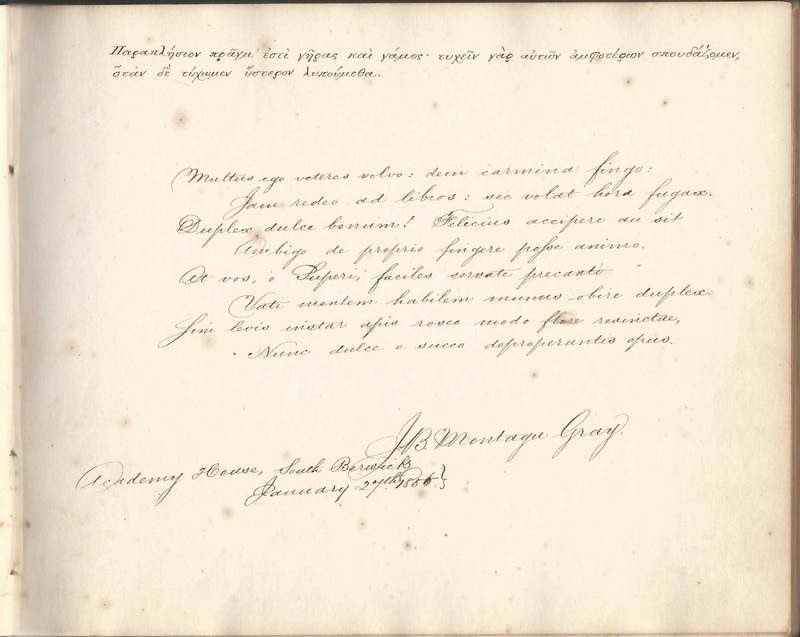 Joel Mann (1789-1884), whose wife Catharine (Vernon) Mann signed the following page. Catharine Mann, signed at Kingston, Rhode Island, on July 13, 1855. She was Catharine (Vernon) Mann (1787-1871), wife of Rev. Joel Mann, who signed the previous page. Hattie Mann, or Kattie Mann, signed at Kingston Classical Seminary on July 13 [no year written, but presumably 1855 when Rev. Joel Mann and Catharine (Vernon) Mann signed. W. Smith Meserve of Durham, New Hampshire, signed at Berwick Academy on February 11, 1856. Winthrop Smith Meserve (1838-1915) of Durham, New Hampshire; married Eliza A. Tuttle on November 30, 1861. Abbie Northup, signed at Wickford, Rhode Island, on March 31, 1856; "your cousin". Middle initial looks like U or O. Possibly Abbie Olney Northup, daughter of Abial Palmer Northup, who was a brother to John Palmer Olney's mother Abigail Remington (Northup) Olney. Sallie S. Northup, signed at Wickford, Rhode Island; sister of signer Abbie O. Northup and cousin of album owner John Palmer Northup. John P. Olney of Wickford, Rhode Island, album owner; he inscribed a page on July 10, 1855: "I beg a tribute from all, for John P. Olney of Wickford, R.I., July 10th /55"
Mary E. Raynes, signed at South Berwick, Maine, on January 18, 1856. Her sister Olive Raynes also signed a page. They were the daughters of Francis and Harriet Raynes. Olive Raynes, signed at South Berwick, Maine, on January 26, 1856. Her sister Mary E. Raynes also signed a page. They were the daughters of Francis and Harriet Raynes. 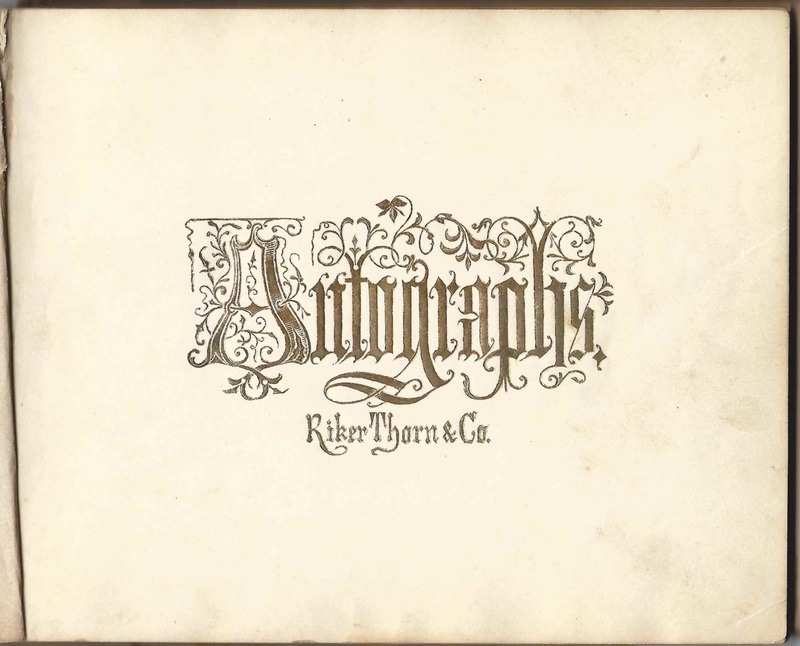 E. G. Raynes; not sure of initials; signed at South Berwick, Maine, on January 23, 1856. Possibly Edward G. Raynes, brother of signers Mary E. Raynes and Olive Raynes, or their sister Elizabeth. Jennie H. Robinson, signed at Kingston Classical Seminary on July 17, 1855. Sister of signer James A. Robinson; they were the children of Attmore Robinson of South Kingston, Rhode Island. James A. Robinson, signed at Kingston Classical Seminary on July 17, 1855. Presumably the brother of signer Jennie H. Robinson; they were the children of Attmore Robinson of South Kingston, Rhode Island. Hannah Robinson, signed at Kingston, Rhode Island, on July 17, 1855. Presumably the sister of signer George Robinson. George Robinson of Kingston, Rhode Island, signed on July 17, 1855. Presumably the brother of signer Hannah Robinson. Lizzie W. Rollins of Rolllinsford, New Hampshire, signed at South Berwick, Maine, on January 29, 1856. Presumably Elizabeth W. Rollins (1837-1911), daughter of Daniel and Mary (Plumer) Rollins. George H. M. Rowe of Salmon Falls [no state written, but presumably Maine or New Hampshire], Maine, signed at Berwick Academy on February 11, 1856. George Howard Malcolm Rowe (1841-1916), who was born at Lowell, Massachusetts, the son of Jonathan Philbrick Rowe and Maria Louise (Morrison) Rowe, would later attend Dartmouth College and served as Supt. of Boston City Hospital for about thirty years. Rosalie Steinfeld of Germany, signed at South Berwick Seminary in 1856. Moses R. Varney, signed at South Berwick, Maine, on February 12, 1856. Presumably Moses Russell Varney, born about 1839, son of Moses and Permelia (Hanscom) Varney and future husband of Josephine M. Driscoll whom he married 17 October 1867. Amos P. Wells, signed at Kingston, Rhode Island, on July 17, 1855. Presumably Amos Palmer Wells (1834-? ), son of Thomas Robinson Wells and his second wife Emma (Palmer) Wells. Philon C. Whidden, signed at South Berwick Academy on February 11, 1856. Presumably Philon Currier Whidden, son of Josiah and Eliza Whidden. He was a Civil War veteran and later practiced medicine at Boston, Massachusetts. Carrie F. Yeaton, signed at South Berwick, Maine, on February 3, 1856. Presumably Caroline Frances Yeaton, born December 18, 1839, daughter of Isaac P. and Frances Yeaton and future wife of Charles W. Varney. I'm a graduate of Berwick Academy and am also interested in this item.